This is the first book in a brand new series by Raven Snow and I have a feeling I am going to enjoy reading them all as they come out. Lady leaves home because her foster parents said she had to get rid of her cat who she had named Lion. Now Lion is a very good cat in general but like all cats makes sure his human does what he wants. He was silent on the bus trip until a certain point--then he made such a racket meowing that they got kicked off the bus in a tiny town named Dark Lake. They are taken in by a woman who owns the only hotel in town. However she has to do chores. Some very strange ones at that. Meanwhile Lion is in his glory--and every one likes him. Lady was planning on leaving the very next day----but things started happening. Up until the very end Lady is insisting that she is going to leave the town, after all the mysteries are solved. At the end she finally realizes that Dark Lake is where she will be staying and thus we wait for the next in this series! Lady makes a lot of rash decisions. Her most recent was leaving home because her parents wouldn’t let her keep a cat. It’s not long before she leaves the city of Atlanta behind only to find herself stranded in the small, mysterious town of Dark Lake. 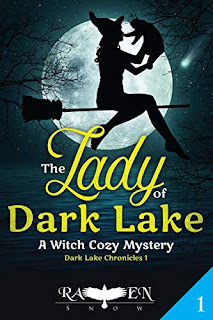 Dark Lake has a lot of secrets, secrets Lady doesn’t want to get herself involved in. She wants nothing more than to get on the next bus out of town, but Dark Lake seems to have other plans. Soon, Lady finds herself mixed up in a possible murder. There was a body found in the eponymous lake of Dark Lake, and she was the one that reported it. Between a grim mystery, a landlady who calls herself a witch, and her tabby cat, Lion, starting to talk to her in her dreams… Lady’s life is taking a downright bizarre turn. First Volume of the Dark Lake Chronicles Series. Approx. 51,000 words in length. It is a standalone (reading prior or future volumes not required to enjoy the book, no cliffhanger). I have never participated in a linksy challenge before but it is fun. I did share your post on all my social media sites I hope you get a lot of visit.